But the "heckler" was comedian Larry David, who before Trump arrived on-stage had been seen impersonating Democratic presidential hopeful Bernie Sanders. Demonstrators marched through the streets of New York City to protest Trump's views on immigration hours before the appearance. Dozens of protesters held signs and chanted Saturday evening as they marched from Trump Tower to NBC's studio in Rockefeller Plaza. Outside Rockefeller Plaza, they chanted: "Donald Trump has got to go." Some of the protesters say Trump's statements about immigration are racist and offensive. 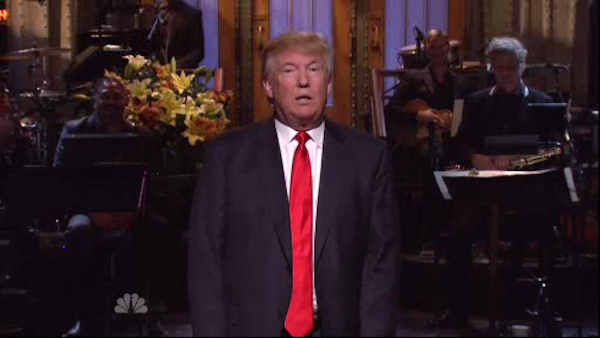 NBC has faced pressure from a coalition of advocacy groups calling for Trump to be dropped from SNL over his comments that cost him his role hosting "The Apprentice." The network has not responded, and Trump says he believed the controversy would boost the audience for the episode.